I'm especially proud of my daughter tonight. 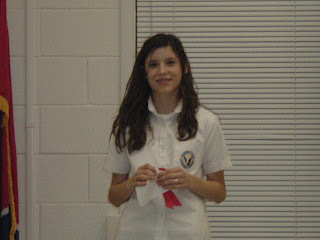 She and her classmates competed against another middle school tonight in a Lincoln/Douglas modified style debate. She ended up in second (2nd) place overall. What a great evening we had as a family. My wife and I had a dinner to attend, but we knew it was much more important to go support our daughter in her endeavor. There will be many other dinners to attend. Her school did really well and we are proud of all the kids who competed. After receiving very little rain of the past several days, we were blessed to receive .65 inches of precipitation in just over 20 minutes today. Our plants really needed more, but we are HAPPY with what we got! All is quiet on radar for now. The expectation for rain over the next several days will keep chances around 60% in our forecast. As a home schooler, I never do debates, but I did do a science fair project earlier this year and got first. Competitions can make you nervous, "Weather" its one person or many you perform in front of. I know I was. I'm glad we had the rain. The ducks wanted more but they'll take what they can get. what did you do your science fair project on?